Masottina was founded in 1946 in Conegliano Veneto. It is an established family estate that crafts elegant and polished wines from both local and international varietals. The Colli di Conegliano terroir is a kaleidoscope of stunning panoramas. From the rolling hills to the more defined lines of the countryside via the rigid rows of vines and the forests of the Pre-Alps, this is a land of extraordinary beauty, defined by the presence of man, who has brought art and history to the area since Roman times. 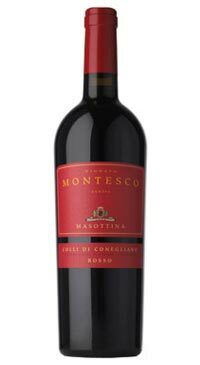 It is here that one of Masottina’s most prestigious wine is created: Montesco. The perfect fusion of Cabernet Sauvignon, Merlot, Cabernet Franc and a small percentage of the autochtonous Marzemino grape, Montesco is characterised by the complexity and richness of its bouquet, which invokes the scents of the undergrowth, with spicy notes reminiscent of tobacco, black pepper and vanilla. On the palate, it strikes a pleasing balance between acidity, freshness and elegant tannins. Intense and luscious from the moment you clap eyes on its ruby colour, it is a wine that delights with every sip.